My childhood best friend, Nancy, lives about 1200 miles away from me. 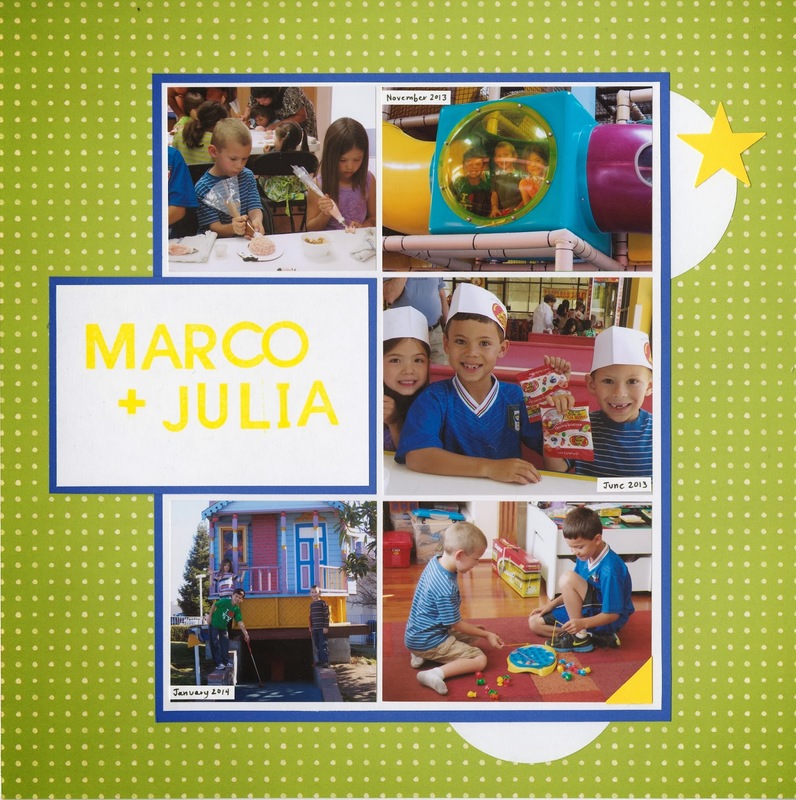 She has two kids, Marco (a year older than Trevor) and Julia (a year younger than Trevor). Trevor adores them. Nancy's parents live part-time in our hometown (about an hour away from me, where my parents still live), so we usually get to see Nancy, Marco and Julia about once a year when they're in town to see them. Last year, they made three visits to our area within a 6-month span. What a treat to spend so much time together! I took a lot of pictures of the kids playing together during the three visits and chose five to combine into one layout. I ended up not putting any journaling on the layout. The title says their names, the dates are on the photos, and the activities we're doing together are fairly obvious. I kept the layout really simple, bright and happy. I hope it helps Trevor remember great times with good friends who live much too far away. We just got back from our annual snow trip to my inlaws' cabin in Bear Valley. I'm happy to report that it went much better than last year's total fiasco. 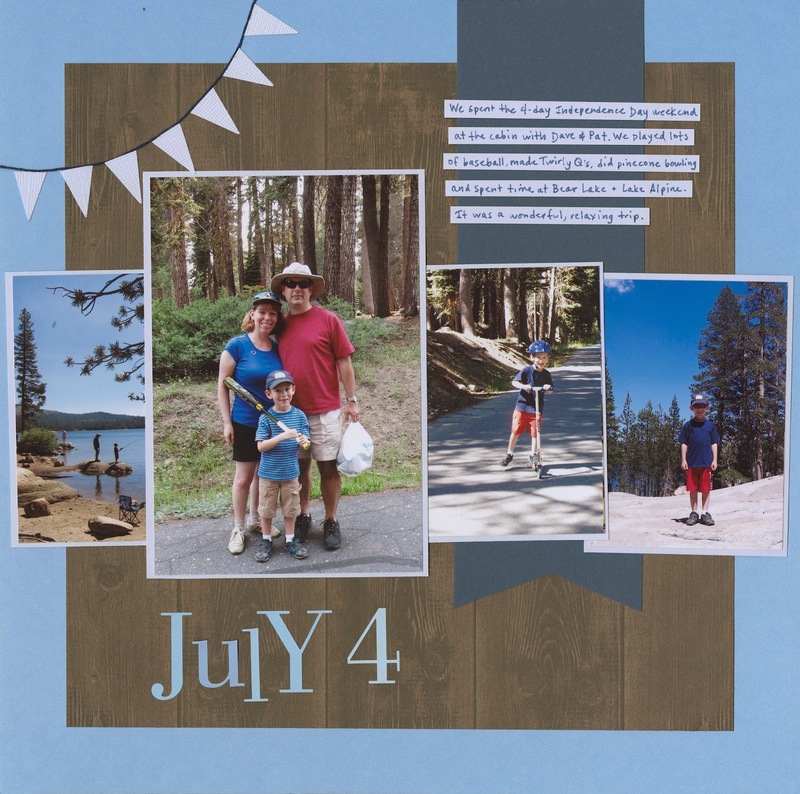 This was our first visit since the July 4th weekend, which is the layout I'm sharing today. For inspiration, I used a sketch by Allison Davis. I kept most of the elements but simplified quite a bit. I'm looking forward to scrapping my photos from our snow trip. Hopefully that layout will be done before our next trip to Bear Valley! 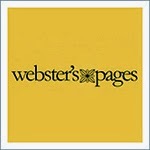 As I mentioned yesterday, my article-writing job with Scrapjazz/Scrapbook.com has ended. 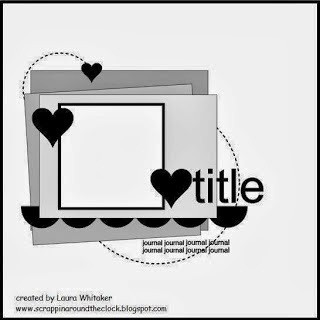 While I am still working for Scrapbook.com writing product descriptions (and still working as the Editorial Assistant for Fun Family Crafts), I am no longer doing design work for any sort of store. I've been designing for stores continually since 2010, so it feels a bit unfamiliar to be able to use whatever products I want to use on all of my layouts. 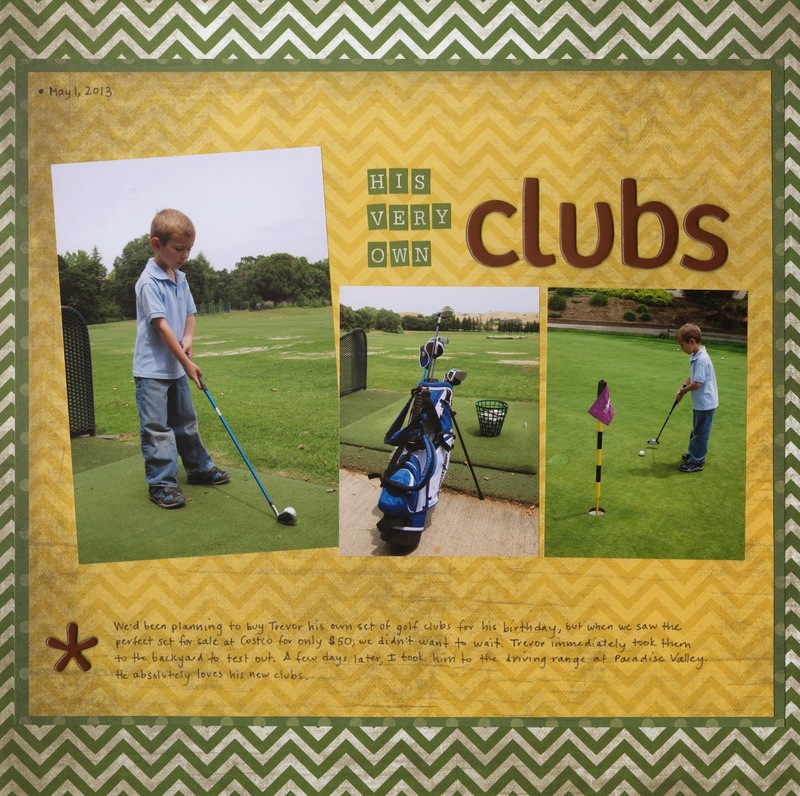 My first experience designing for a store was in 2008 when I was selected for the Design Team at a local scrapbook store. My job was to design the layouts that would be taught in their classes. Everything I put on the page had to be available in the store. If it wasn't on the shelves (and in a large enough quantity), it couldn't go on my page. I couldn't add even a single rhinestone or button or ribbon scrap or whatever else from my stash. I couldn't even use a journaling pen that they didn't carry! The store was a decent size and had a lot of supplies, but on practically every layout there was something I wanted to add that simply wasn't available in the store. I also had to consider pricing. The supplies for my layouts had to retail for a certain amount. If I used one sticker or other unique item from a package, I had to cost the entire package. It was a whole different way of designing than what I'd done before. Here's one of the layouts I designed for their summer break kids' camp. Because it was going to be made by children, I was supposed to make sure there weren't any difficult or overly time-consuming techniques and I had to keep the cost really, really low. The result was really clean and simple, even by my standards. If I'd been making this for myself, I would have done some different things - maybe added chalks on the veggies, or a stitched sun, or little brads to look like nails on the plant stake. 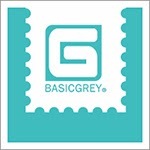 In 2010, I started designing for an online store specializing in supplies the big box stores don't carry. I worked with them for just under three years. While the requirements for my projects weren't anywhere near as strict as with the LSS, I still had to make sure that my layouts highlighted the manufacturers and supplies the store carried. It was not always easy to blend my clean and simple style with their predominantly feminine, shabby-chic products. Here's one example. If I'm not mistaken, this is the one and only time I've used a lace trim on a layout. The papers are actually from a wedding collection. I like the finished layout, but it was a struggle to make at the time! I kept wanting to remove the frilly, vintage elements and replace them with something clean and graphic. For the past two years, a lot of my scrapping has been creating projects to accompany the themes of my articles. Obviously, when you write articles for a store, you need to use products that are available for sale in that store. Scrapbook.com is huge and has zillions of products, but they don't carry a lot of older patterned papers, for example. There were times I wanted to use an older line, but it was no longer carried so I needed to switch gears. Here's an example. I like the way this turned out, but the patterned papers weren't my first choice for the layout. I picked out some other stuff, did a search and learned that they were discontinued, and switched them out for the current papers you see. Of the three stores, Scrapbook.com has been the easiest to design for by far, simply because they carry literally hundreds of times as much stuff as the other stores did. Even so, I wasn't able to use huge amounts of my stash for assignments since it is simply too old. I'm not actively searching for a design job, but if I were offered something, I'd definitely consider it. In the meantime, I'm enjoying the total freedom of being able to scrap whatever topic I want, using absolutely any product I want. It's been great seeing my stash of really old product finally starting to shrink a bit. I say "final" because the folks at Scrapbook.com decided that it no longer made sense for them to be paying to publish daily articles. So the job that I started with Scrapjazz.com two years ago (that transferred to Scrapbook.com in August) has ended. I have mixed feelings. I've enjoyed writing the articles, but with this job ending, I've gained some freedom in my scrapping. More on that tomorrow. Wolves and dogs have 42 teeth. A pair of dice has a total of 42 dots. There are 42 visible eyes on a deck of 52 cards. My friend Adam shared two 42-related Judaism facts with me. There are 42 lines of text in each column in a Torah scroll (read about that here). One of the mystical names of God has 42 letters (read about that here). Fascinating! I've learned a lot more about the number 42 that I'll share in future posts. Today I want to talk about my first 42-related project. That project? Ridding myself of 42 pounds. I don't mean losing 42 pounds off my body. While I'd be happy to lose about 10 pounds, losing 42 pounds would land me in the hospital. Heck, no matter how much a person weighs, losing 42 pounds in 12 days is probably going to land them in the hospital. No, my goal was to rid myself of 42 pounds of unnecessary stuff sitting around the house. It feels really good to have it all gone. I don't think I'll miss any of those items. I'm certainly enjoying cleaner, more roomy closets and cupboards. I've never cleaned with a goal of getting rid of a specific amount of stuff. It was surprisingly motivating! I'm definitely going to use the same strategy again. Goodbye to the unnecessary 42 pounds! Trouble brings us joy each and every day and I can't imagine our lives without him. 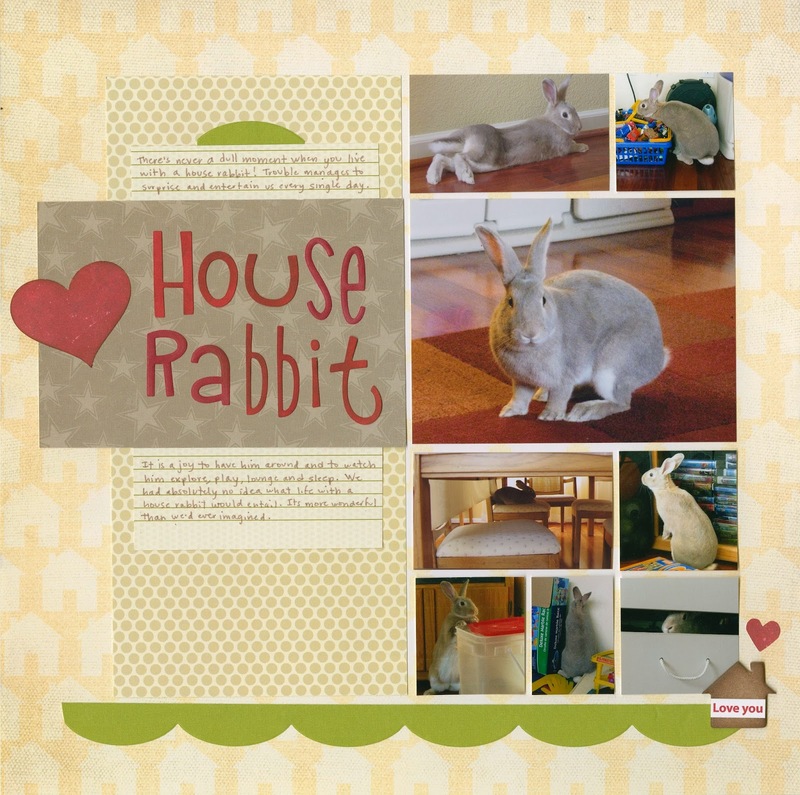 To learn more about life with a house rabbit, go here. People ask me where I get the ideas for my projects. Sometimes I don't know - ideas just pop into my head all the time and I don't know why or how. Other times, I know exactly what inspired an idea. Such is the case with my Bunny Popcorn Cups. .... and I knew right away that I wanted to make a rabbit version. Materials: clear plastic cup, white and pink craft foam, googly eyes, pink Jelly Belly, monofilament or white cardstock, a white pom pom, scissors, black craft foam or a Sharpie, and a hot glue gun. And popcorn, of course. Begin by cutting ears from craft foam. Make whiskers from thin strips of cardstock (like I did above) or from monofilament (like Trevor did below). Cut a mouth from black craft foam (like I did above) or draw a mouth with a Sharpie (like Trevor did below). Heat up the glue gun and attach the ears to the inner rim of the cup, then add the eyes, whiskers, nose, mouth (if using craft foam), and pom pom tail. Fill with popcorn for a tasty treat. I should clarify that popcorn is a treat for humans, not for rabbits. I've seen videos of people giving popcorn to rabbits and they seem to love it, but popcorn is not safe for them. Appropriate treats for rabbits include tiny amounts of dried fruits (Trouble especially loves raisins and Craisins), fresh fruits (banana, apple, peach, etc), and sweet vegetables (carrots). Check out the House Rabbit Society's Diet Page for excellent information about exactly what to feed rabbits to keep them healthy and happy. Speaking of healthy and happy rabbits, I was working upstairs the other day and heard Trouble doing a Super Run so I grabbed the camera and raced to the stairs to try to catch it on video. I missed the Super Run and instead got to watch him go from sitting to lounging. It's pretty cute. He does it all the time, but I've never managed to record it before. Trevor did some volunteer work awhile back and was given a flat of these Snapple Jelly Bellies as a thank-you. I've been saving the empty containers to hold all sorts of small items, like sequins and brads. To make the bunny, I started by removing the label from the container (it peels off easily, leaving a perfectly clear container behind). Then I dumped out the Jelly Bellies from two different Snapple containers, mixed them, and refilled the container with the mix. I gathered my materials: white felt, a pink ink pad, a white pom pom, googly eyes, monofilament, a Sharpie, scissors, and the glue gun. Return tomorrow for Day 3 of Bunny Week! Welcome to the 2nd Annual Bunny Week, here at My Creative Life! All week long, I'll be sharing rabbit-related projects and information. As I said last year, it's like Shark Week, but fuzzier. This year, I'm starting off Bunny Week with a Bunny Magnet for the fridge. Materials: ice cream paddle spoon, white paint, white and pink cardstock or construction paper, googly eyes, small pink pom pom, and a magnet. You'll also need scissors, glue and a black pen. Start by painting the ice cream paddle spoon white and letting it dry. While it is drying, cut out two ears, a tail, and thin whiskers from white cardstock. Cut inner ears from pink cardstock. Glue the inner ears to the outer ears, then glue them into place. Draw a mouth, then glue the whiskers, nose and eyes into place. Glue the magnet and the tail to the back. They look awesome on the fridge. You'll have to take my word for it, as they photographed terribly against the reflective black surface. Return each day this week for more bunny crafts and information as Bunny Week continues! It's time for a Mythbusters update. Steve and I are volunteers for a Mythbusters episode. So much fun! We're told that the episode will air in 3-5 months. We can't wait! It's killing us not to be able to talk about it. Discovery starts airing adds for the upcoming season of Mythbusters. Our episode is among the previews and it looks awesome! Our episode has aired in Australia and the UK, but not in the US. We learn that they've titled it "Plane Boarding." The season ends without our episode airing here. We avoid looking online to learn the results of the experiment. Steve and I are contacted to apply to be volunteers for a second Mythbusters episode. We have to send in photographs of ourselves and our cars. Steve is accepted and I'm rejected. We learn that "Plane Boarding" aired in the Netherlands. Steve films his segment and learns that it was my car that was rejected (as opposed to me being rejected). The producer tells Steve they need more volunteers for a future filming date and tells him I can be a volunteer if I drive Steve's car instead of my own. I happily agree. Steve and I compare notes (as we're allowed to talk with other volunteers but no one else) and find out that we each did different experiments that will come together in one episode. Our episode is supposed to air in 3-5 months. It's now been 16 months since "Plane Boarding" was filmed and 8 months since the car episode was filmed. Neither have aired in the US. The fall previews begin airing and, once again, we "Plane Boarding" amongst the clips. Discovery airs a Season Finale. Neither of our episodes aired this season. So, that brings us to now. It has been 22 months since we filmed "Plane Boarding" and it has aired in three different countries. We've seen it advertised on TV and on the website. There is information about it on Wikipedia and the episode is available (illegally, I suspect) online. It has been 14 months since we filmed the car episode. We don't know what it's titled, we don't think it has aired anywhere, and we have never seen any footage of it amongst all the previews. I'm the proud godmother of three. I've blogged about my goddaughters often. Trevor and I met Kylinn and her mom Courteney at baby storytime at the library when Trevor was 7 months old and we've been close ever since. I was lucky enough to be there three years later when Ellia was born. It was an honor to become Kylinn and Ellia's godmother in May 2011. My third godchild was born in March 2013. His name is Teagan, and he is the son of my cousin Tim and his wife Ginger. They live about 1000 miles away. Teagan's baptism was held exactly one week after his birth (to accommodate Ginger's visiting family). With such short notice, I wasn't able to make the trip to attend the baptism. I met Teagan for the first time when he and the rest of the family traveled to California to attend the baptism of my niece Allison four months later. Here's the layout I made to coincide (almost) with the anniversary of his baptism. Teagan's godfather is his cousin Ryan, my cousin's stepson. I used this sketch by Laura Whitaker for Let's Get Sketchy. This was my first time playing along at Let's Get Sketchy. When I saw this sketch, I thought it would be perfect for my photo. I decided to experiment with vellums. I followed the sketch almost exactly, using vellum for every component except the black cardstock that is matting my picture. As is always the case with vellum, I had to be very thoughtful about where I put adhesive so that it wouldn't show. I painted the vellum letters then added Stickles on top for sparkle. The scan doesn't do the layout justice. I'm really happy with how it turned out. My friend Kristen is a librarian. 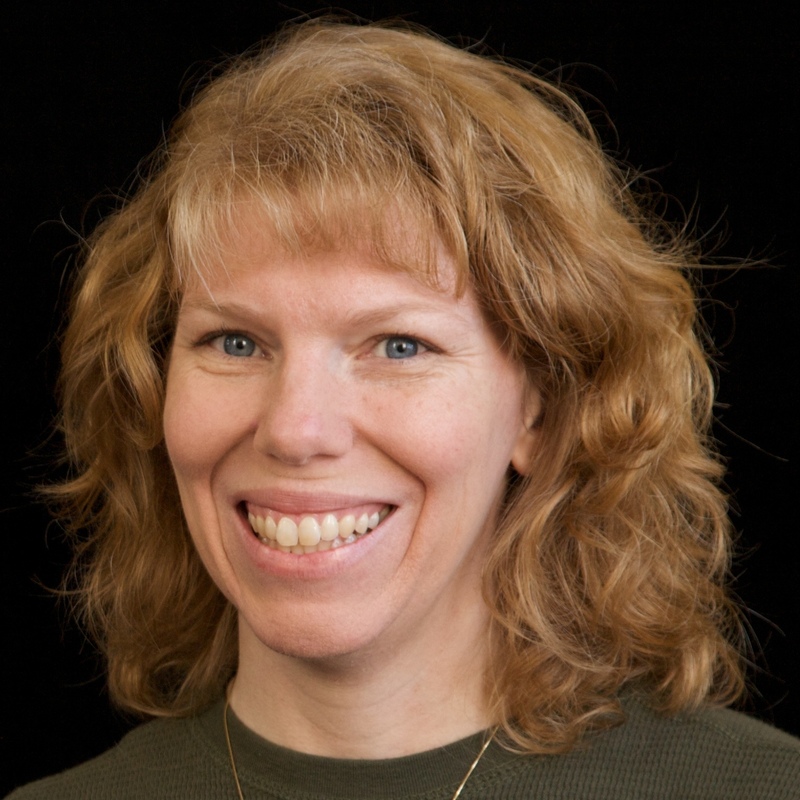 She recently asked me about teaching low-cost scrapbooking and/or crafting workshops at the library. I immediately thought of quilling. It's easy to learn, extremely inexpensive, requires very few materials, and is unfamiliar to most crafters. It would be the perfect craft to teach. Kristen had never heard of quilling, so I invited her and our friend Kelly over to my house for brunch and quilling. I pulled out the materials from the quilling workshop I taught two years ago and we got started. It literally took less than 5 minutes of instruction before they were off on their own, trying each shape and eventually putting them together to make quilled works of art. Quilling really is a great craft for beginners. Both Kelly and Kristen loved quilling. Yea! Kelly commented on how relaxing it is. I completely agree! Kristen is gung-ho to have me teach a quilling workshop at the library, which sounds like great fun. Local friends - I'll let you know when we have something scheduled if you'd like to join us! Today I am 42! I'm excited. Birthdays are fun, particularly since I realized two years ago that (with a little bit of effort) one can make a birthday celebration last the entire year. The past two years have been wonderful, due largely to my 40 Things and Project 41 adventures. I have high hopes that 42 will be just as great. I've been thinking about how to celebrate 42 for quite some time. I was a teenager when I read Douglas Adams' The Hitchhiker's Guide to the Galaxy and learned that 42 is the Answer to the Ultimate Question of Life, the Universe, and Everything. I knew I wanted to tie into that somehow. After a lot of thought, I've decided that I'm going to discover everything I can about 42. If 42 is the Answer to the Ultimate Question of Life, the Universe, and Everything, then it could be really fun to learn more about this (seemingly) ordinary number. I've done some preliminary research and found all sorts of fun facts and lists about the number 42, as well as books, music and movies with 42 in the title. I'll learn about the 42nd president and the 42nd state. I'll try "42 foods that..." and I'll try to learn the domino game called "Texas 42." I'm going to immerse myself in discovery and see where it takes me. Today is the end of my yearlong celebration of being 41. When I started Project 41 last March, I wasn't sure what to expect. I knew I'd be getting ice cream with friends each month (which is, in itself, pretty cool) but what I didn't anticipate is how meaningful the experience would be. Some of my companions were people I see often, but most were people I don't see regularly. In a few cases, it had been years. The scheduling was sometimes difficult and often one or both of us had to go out of our way, but it was always worth it. I truly appreciate each of the twelve people who joined me this year. I had such fun putting together this layout with all 12 pictures. What an amazing group of people and such wonderful memories. Of course, the flavors are no reflection on my companions, who were all fantastic. 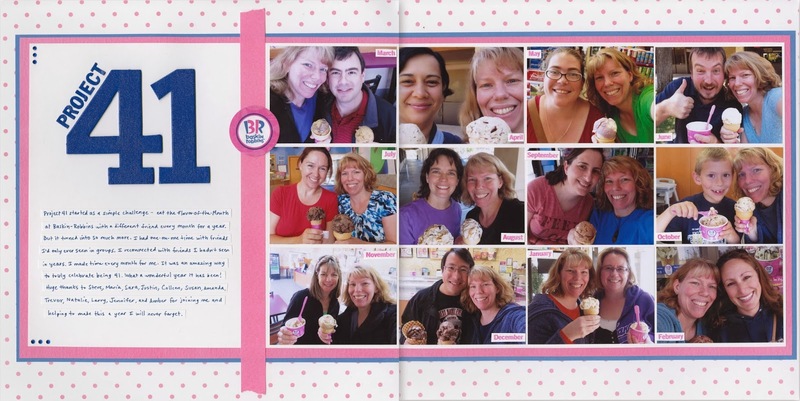 Over the twelve months, I visited six different Baskin-Robbins locations (Fairfield, Suisun, Vacaville, Martinez, Pleasanton, and Livermore). No reason to rank those, as all of them were fine except for the one that didn't honor my coupon, couldn't take a gift card, had filthy tables, and featured stacks of beer and chips as decor. Thanks again to Steve, Maria, Sara, Justin, Colleen, Susan, Amanda, Trevor, Natalie, Larry, Jennifer and Amber for making my 41st birthday stretch into a year of fun! 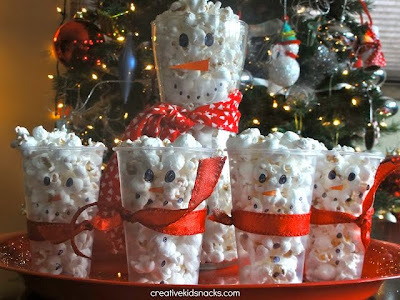 I love snowmen. 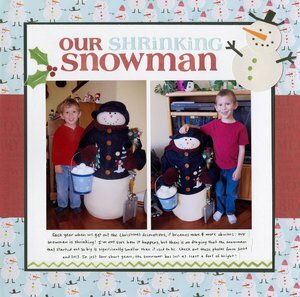 Amongst the many snowmen that decorate the house each December is a large stuffed snowman. Trevor poses with him every year. I'm pretty sure the snowman has been gradually shrinking over time. Check out the photos from 2009 and 2013 and see if you agree with me. I really like how the layout turned out, so I worked backward from it to make a sketch. 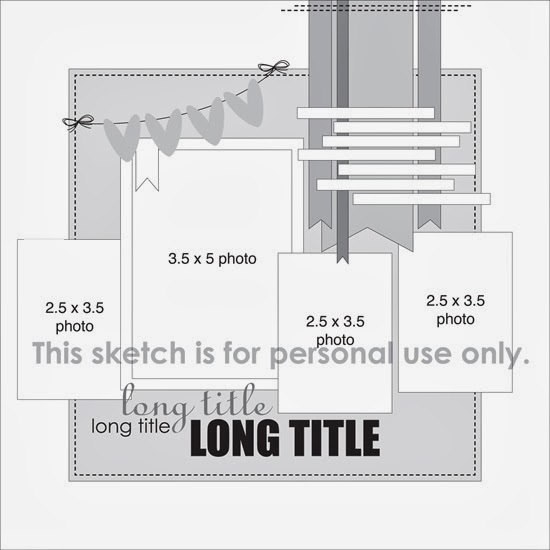 I shared the sketch with the team at Ideas for Scrapbookers. Five of the contributors made layouts from my sketch and I was blown away with what they did. They are all completely different. Head over there to see what each of them made! 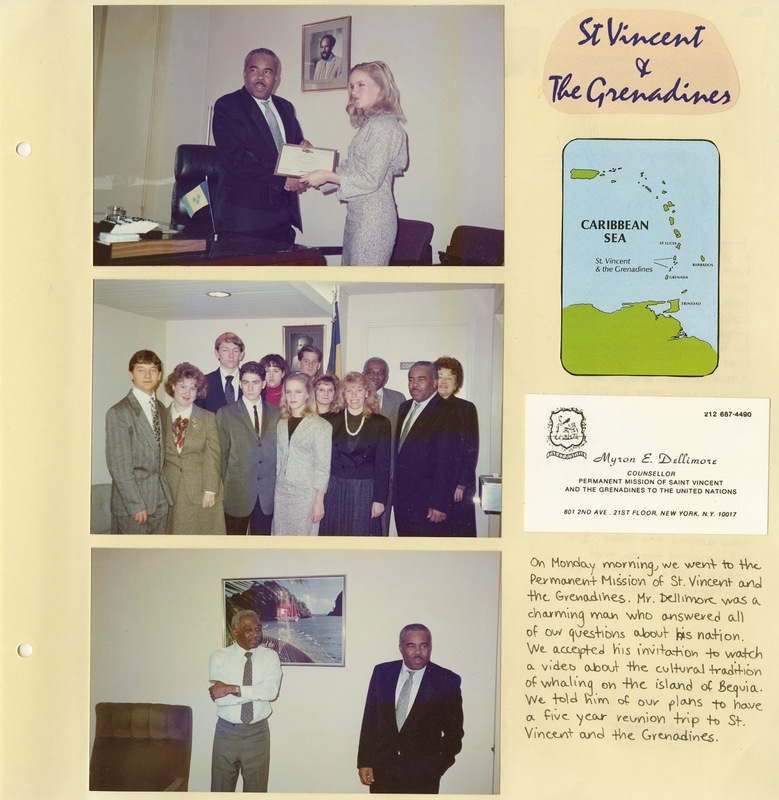 I've promised several times to explain my connection to the small Caribbean nation of St. Vincent and the Grenadines. It's not easy to explain, but I'll try. 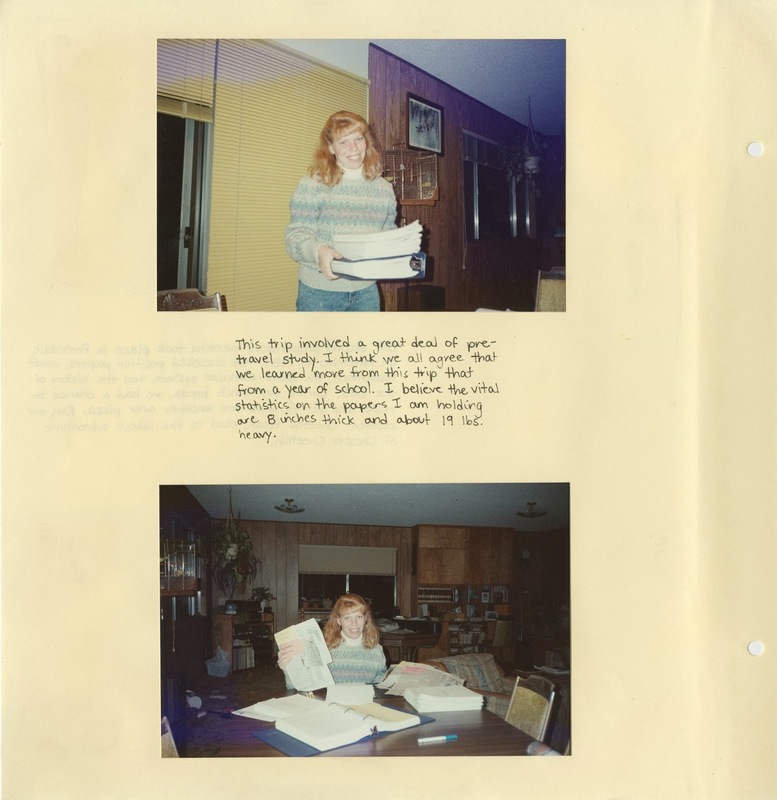 Back in 1989, I was 17 years old and very involved with 4-H. I wasn't just sort-of involved. I was VERY involved. One of the most prominent leaders at the state level, a powerhouse of a woman named Luella Zamzow, decided to gather up a group of the 'best and brightest' 4-Hers from across California and groom us to participate at the Model Organization of American States (MOAS) in Washington D.C. The Organization of American States (OAS) is an international body similar to the United Nations. The primary difference is that member-states are all from the western hemisphere. But the function and purpose is basically the same as the UN. 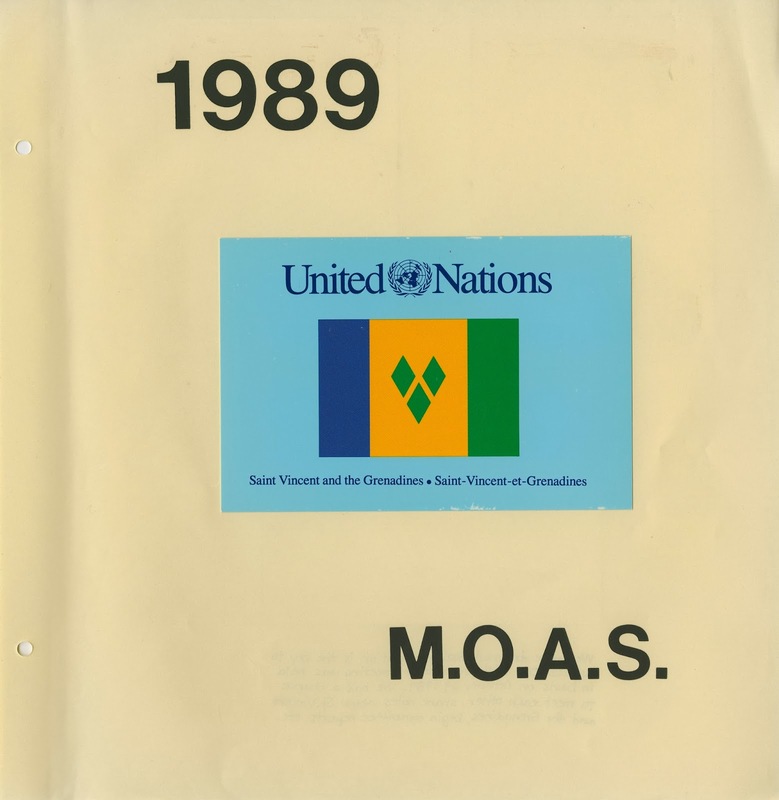 Each year, the OAS conducts a Model OAS (just like a Model UN) for high school students. Typically, each country is represented by a top-notch school (often a boarding school) from the east coast. The students selected for MOAS take preparation courses as part of their schoolwork. In most cases, it's a two-year program of study before they're allowed to participate. 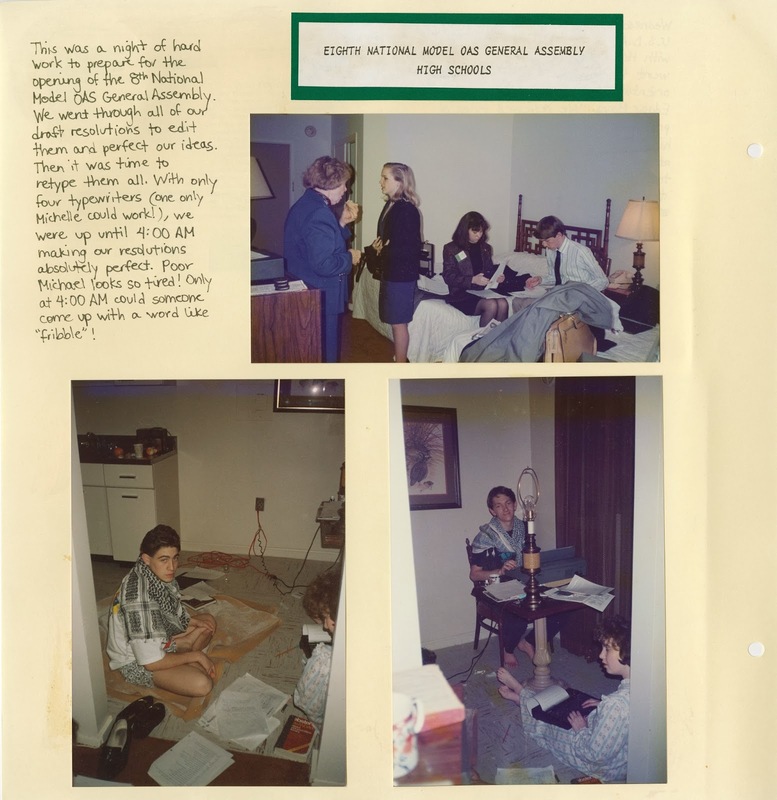 The idea of gathering a group of California 4-Hers, strangers who attended different schools from across the state (public schools, at that), and expecting them to do 2 years' worth of preparations, outside of school, in only a few months? Ludicrous. It's a testament to Luella's reputation that we were allowed to participate in MOAS with the elite prep schools who had been doing this for years. Luella was positive that we 4-Hers would shine It was a lot of pressure. Luella was someone you didn't want to disappoint. 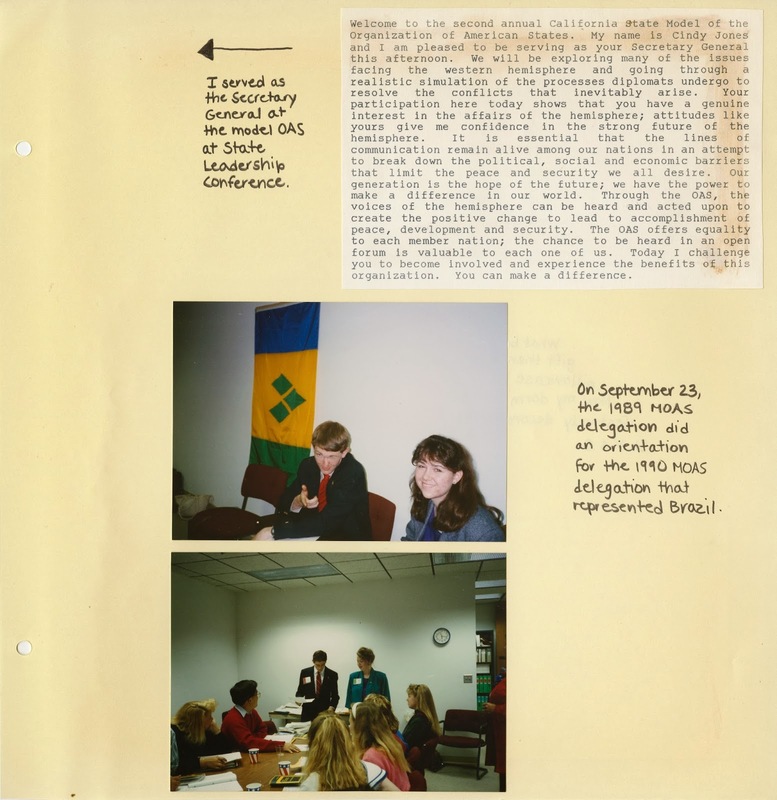 To tell the rest of the story, here are a few of the pages from my 1989 scrapbook about my experience with MOAS. 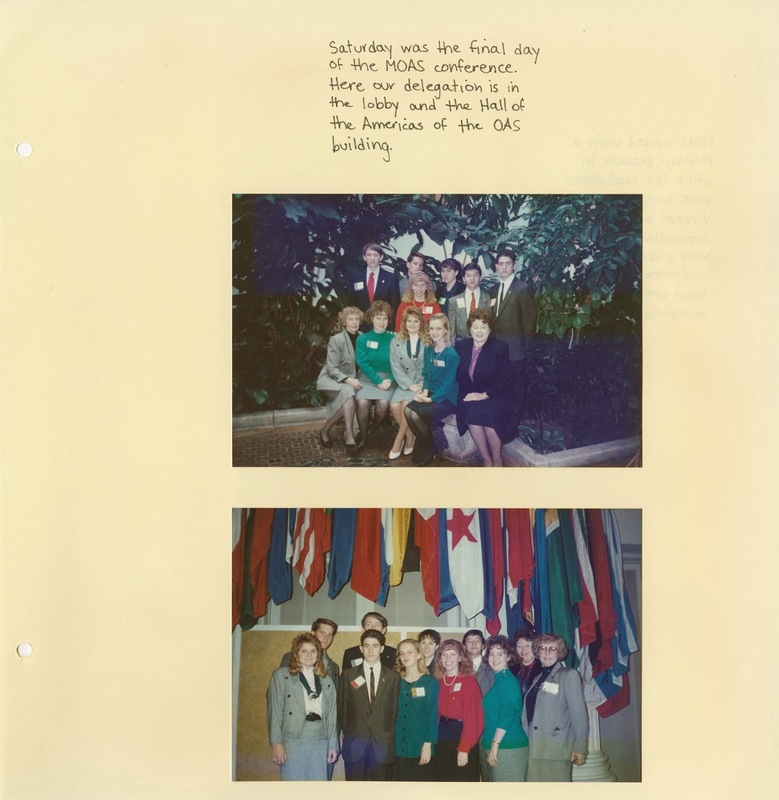 My journey with MOAS began during the summer of 1989 when Luella selected me as a delegate. Preparations began immediately. 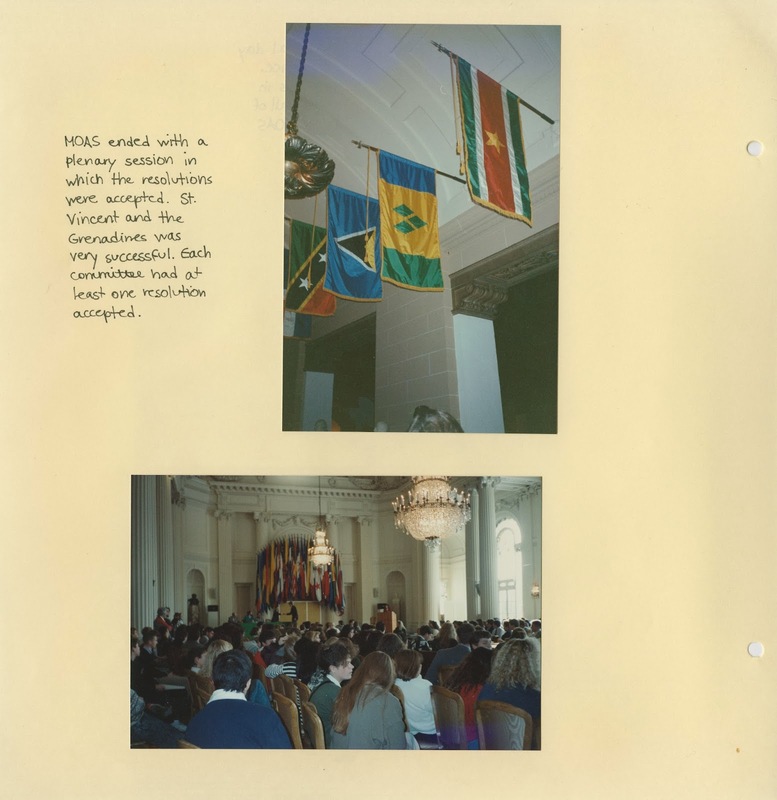 My assignment was to learn everything I possibly could about the OAS, each of its member states, and our assigned country: St. Vincent and the Grenadines. I hadn't even heard of it before, but I dove in and spent the summer researching and studying. The nine of us who would comprise the St. V & G delegation (as we affectionally came to call it) met for the first time in late October. Most of us were strangers or vague acquaintances, so a good portion of the day was dedicated to ice breakers, team building, and determining who would work best together. We shared our research, developed strategies for moving forward, and received a ridiculous amount of material to memorize before our next meeting. We met in person once more, this time about 4 hours in the opposite direction of the first meeting to make it fair for all participants. After that marathon meeting, I would regularly get packages in the mail of more paperwork to read. Here are pictures of me with 19 lbs. of material that arrived one day for me to read. This was, of course, on top of all my schoolwork. I was still attending high school full-time with AP and college-prep classes. Our trip began on 12/2/89 with an early flight from San Francisco to New York City. Of course, we couldn't relax at the airport or on the plane. We spent the whole time working in pairs drafting position papers or reading more material. Once we arrived in NYC, we had the rest of the weekend for sightseeing, museum visits, shopping, and other fun together, including seeing the Rockettes' Christmas show at Radio City Music Hall. On Monday morning, we went to the Permanent Mission of St. Vincent and the Grenadines and met with Counsellor Myron Dellimore. We received a very detailed briefing on everything about the country. We spent the next two days seeing and doing everything we could in NYC, including the UN, Rockefeller Center, the New York Stock Exchange, and going to the top of the World Trade Center. We arrived in Washington D.C. on Tuesday night. On Wednesday, we had briefings at the USDA and at the OAS. We spent every free second on the floors of our hotel rooms going through our draft resolutions and improving them with our new information. Each had to be typed (manually, as this was long before laptops were common). Finally, everything was ready and the Model OAS began. The conference was really intense, but incredibly fun. Our group did exceptionally well and earned a lot of respect. We were just as well-prepared (if not more so) than everyone else. Our participation was a huge success. 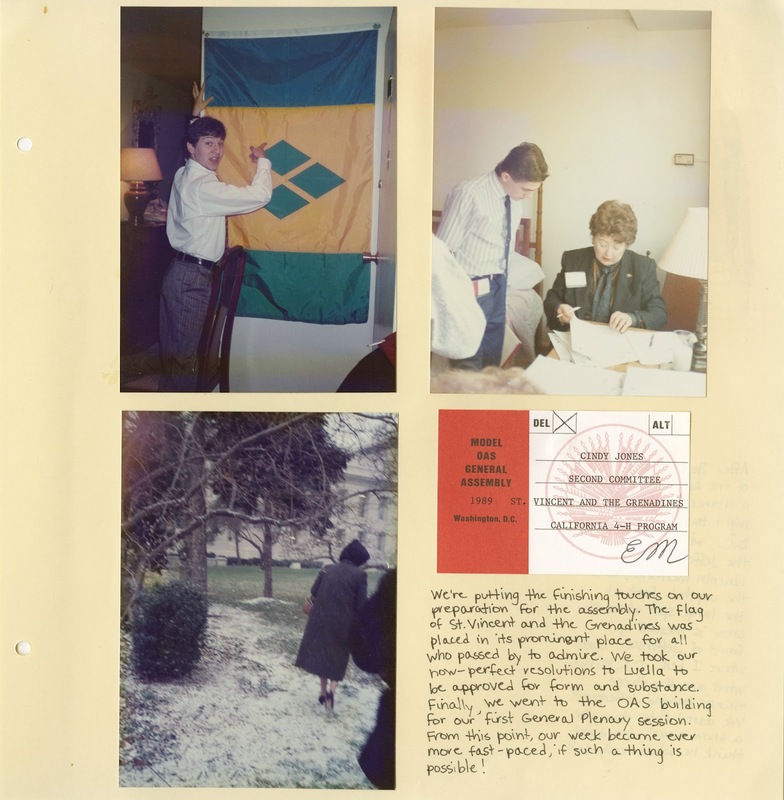 As you might imagine, when a person spends every spare minute for five months studying a particular country in order to accurately represent it at an international conference, you start to feel a strong connection to that country. 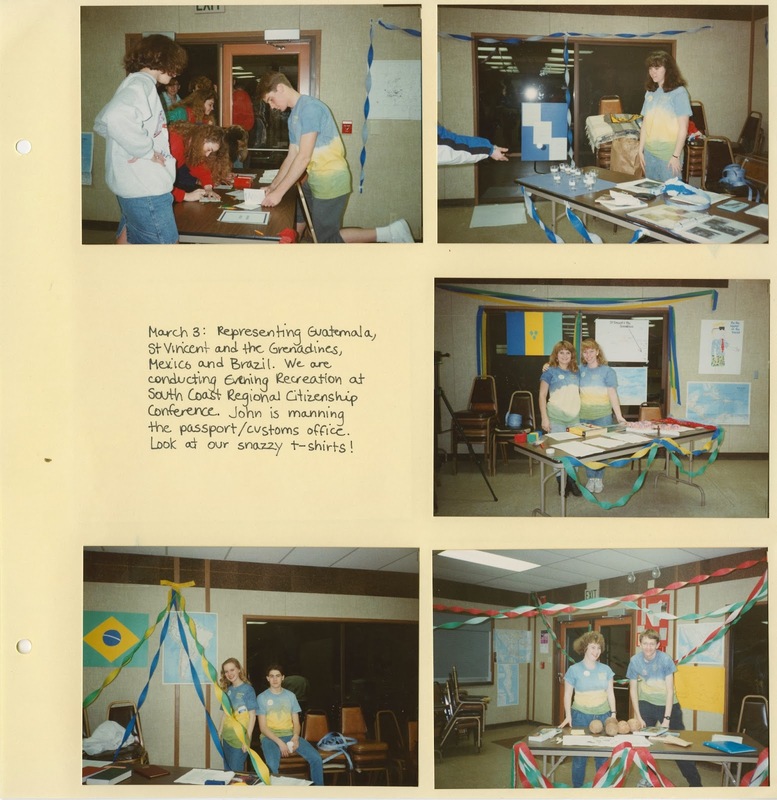 We weren't just California 4-Hers... we were Vincentians. Our MOAS experience didn't end when we returned home after the conference... far from it. We had numerous obligations after the trip. We had several marathon meetings at locations across the state to plan the conferences and trainings we'd be conducting with the information we'd learned. Here we are at a weekend-long Citizenship conference, introducing younger teens to global issues through a series of activities. We dyed our own t-shirts to look like the flag of St. V & G.
Here we are, conducting another training. Our reputation in the high school MOAS was so strong, that we were granted a very high honor, that of representing the United States at the university Model. This was both a blessing and a curse. It required a lot less study (since we were already very familiar with the US and its policies), but even the slightest error would be unforgivable. Every country would interact with the US (unlike St. V & G) and we would have a major role in all of the action. Then Luella shocked me by naming me as Head Delegate. I would lead the US team and be the face of the team for all public addresses. It was, as you can imagine, an amazing experience. I learned so much and had a great time. It's been almost 25 years (!) since I was introduced to St. Vincent and the Grenadines, but all these years later, I still feel as connected to it as I did back then. I'm proud to represent them in our Family Olympics and I swell with pride to see their athletes competing at the Olympics every four years. First and foremost, I'm American... but there's no question that in my heart I'm a Vincentian too. Trevor's obsession with making Star Wars crafts continues. So far this week, we've made a felt C-3PO puppet, a Space Slug from a sock, and an Admiral Ackbar from a paper bag. Of those three, C-3PO was the only one I'd heard of (though I had to look it up to learn how it was written.) So, I suppose one could say that this has been an educational week of crafting for me. I don't have a photo of our C-3PO because Trevor put it away before I had a chance to photograph it. I'm afraid to ask him to get it out (or tell me where it is) because I don't want to have to put on a Star Wars puppet show with him. I do, however, have pictures of the other two projects. We've been using The Star Wars Craft Book as inspiration, but we're not following the directions. We didn't have the appropriate materials on hand for the author's version of the Space Slug and neither of us felt like doing any sewing. So we looked at the picture in the book and came up with our own version. Trevor started with an old sock and stuffed it with wadded-up newspaper. Then he punched black circles from cardstock, glued them to yellow buttons, then used hot glue to attach the button eyes to the sock. He cut a row of jagged teeth from white felt and used hot glue to close up the end of the sock. Trevor LOVES his Space Slug. It's earned a coveted spot in his bed. 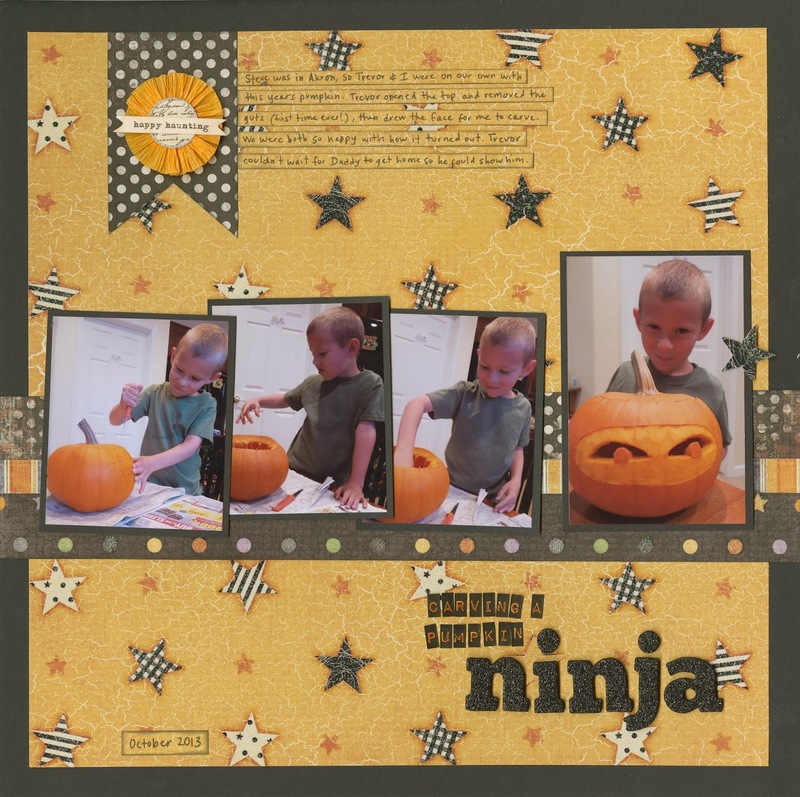 Again, Trevor used the picture in the book as inspiration but switched out the materials and steps to make his own version. I hate to admit it, but the Star Wars crafts are sort-of starting to grow on me.